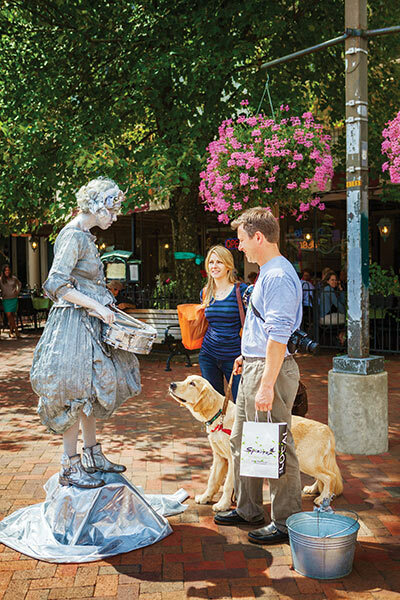 If you want to understand the essence of Asheville, head to the Pack Square Cultural District in the bustling heart of the city. 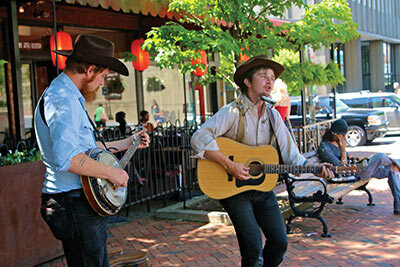 There you’ll find urbanites dressed in all-black, aging boomers, bearded hipsters, stroller-pushing Earth mamas, red-robed Buddhist monks, dreadlocked hikers just off the Appalachian Trail, and tattooed cowboys busking for spare change—all within a span of ten minutes on a weekday afternoon. The people-watching is extraordinary, but to discover the city’s true independent spirit, you have to look beyond the characters and check out the businesses lining the streets. There’s Malaprop’s Bookstore, an expansive indie favorite, known for its great food and coffee and almost daily author events. Then there’s Karmasonics Records, Asheville’s longest-standing independent record store. You’ll find locally owned clothing boutiques offering a range of styles, from hip (Bellagio Art to Wear) to hippie-fied (Indo Apparel), and fabled craft brewpubs like The Bier Garden and Thirsty Monk. 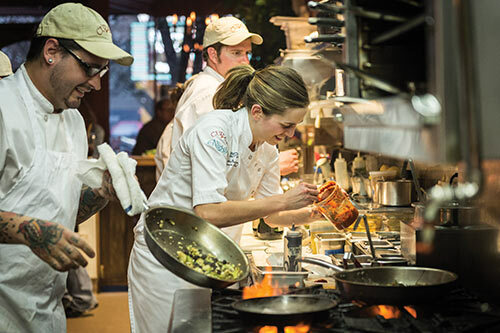 Chef-driven restaurants such as Posana Cafe and Cúrate are critical darlings, and independent live music venue The Orange Peel, voted one of Rolling Stone’s Top 5 Rock Clubs in the U.S., has hosted music acts ranging from Bob Dylan and Beastie Boys to Arcade Fire and Skrillex. The real Asheville is far richer and more complex than its characterization as the Southeastern capital of drum circles and dreamcatchers. In truth, the city is a collective of strong, visionary entrepreneurs and smart small-business owners, a community of creatives and craftspeople, all of them drawn to this small city nestled in the Blue Ridge Mountains of western North Carolina. Set in a historic building that once housed a Prohibition-era speakeasy, this critically acclaimed brunch and supper club offers moonshine, music, and Chef Edwin Bloodworth’s New Appalachian Cuisine. This is an incredible time to visit Asheville, as a palette of autumnal hues paints the surrounding hills and a crisp coolness charges the air. The city’s current buzz as the Southeast’s answer to Portland (another mountain town famous for its natural surroundings, cultural scene, and environmental consciousness) is all the more impressive when you consider that much of downtown verged on the cusp of demolition just twenty-five years ago. Asheville began the twentieth century with a bang, with George Washington Vanderbilt II completing his 250-room Biltmore Estate in 1895. At more than 135,000 square feet, it remains the largest privately owned home in the United States. The New York–based multi-millionaire invested much of his fortune in Biltmore’s Châteauesque-style architecture, antique furniture, landscaped gardens, forestry management programs, and agricultural initiatives. The 125,000-acre retreat became a getaway for his famous friends, including novelist Henry James, inventors Henry Ford and Thomas Edison, and presidents William McKinley, Teddy Roosevelt, and Woodrow Wilson. (Today, Biltmore continues to lure visitors to the area, welcoming more than a million of them annually.) 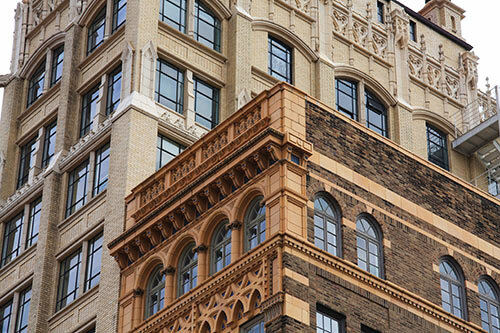 With the wealth that followed the arrival of Vanderbilt and his well-heeled friends came the many art deco–style buildings that define the downtown business district today. Asheville’s nickname became “the Paris of the South” and the town prospered for decades, at one point becoming North Carolina’s third-largest city. But the bottom fell out with the stock market crash of 1929 and the ensuing Great Depression. 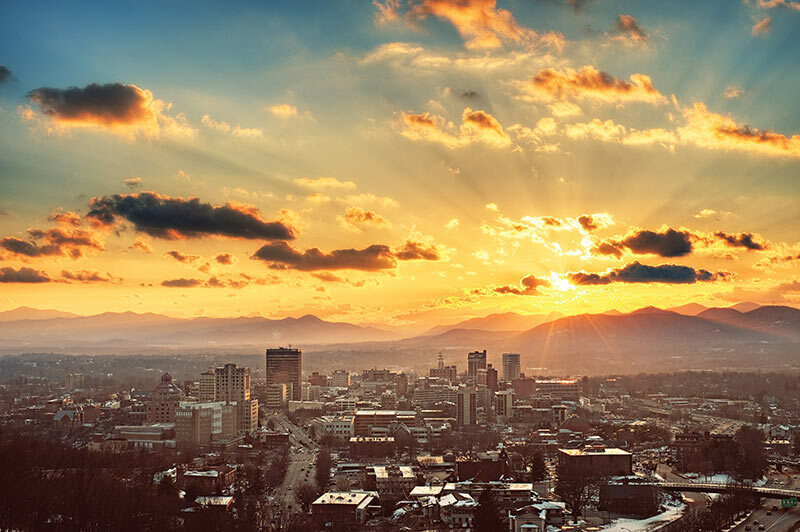 Asheville’s residents shouldered a crippling per capita debt greater than any other city in America due to all the infrastructure improvements that had been made since the turn of the century. All but one of the local banks closed. But Asheville’s public leaders refused to file bankruptcy, resolving to pay back every cent. It would take more than fifty years for the city to recover. Between 1960 and 1980, Asheville’s population declined by ten percent as residents left in droves; eventually, it became a ghost town. Many of the historic buildings were boarded up, and the city’s economy was so awful, they couldn’t even afford demolition to build anything new. But where some saw a city in serious decline, others spotted opportunity. Though small in number, Torno and her friends had a large impact on the city’s growth. Perhaps their most important move was stopping a plan to replace eleven blocks of historic buildings with a shopping mall. These forward-thinking entrepreneurs were helped mightily when two accomplished businessmen, Roger McGuire and Julian Price, added to their efforts to revitalize the city and create an infrastructure to bring tourists to town. Roger McGuire, a former Southern Living executive who moved to Asheville in 1980, invested huge sums of cash (and raised millions more) to fund Pack Place, which houses the Asheville Art Museum, Asheville Museum of Science, Diana Wortham Theatre, and YMI Cultural Center. He also founded the nonprofit group Asheville-Buncombe Discovery, which was dedicated to the revitalization of the downtown business district. Julian Price, heir to the Jefferson-Pilot Life Insurance fortune, established Public Interest Projects (PIP) to fund independent businesses and provide an entrepreneurial model for sustain-able community growth. 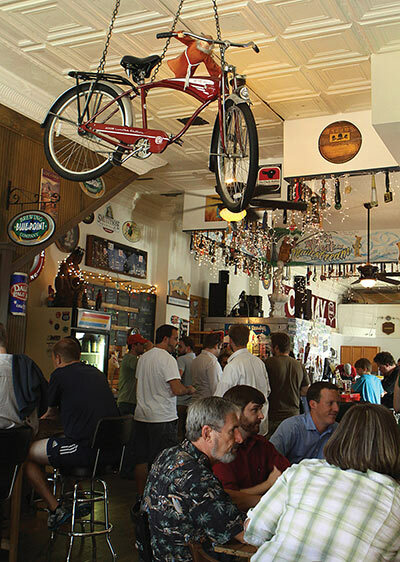 PIP invested in many of the small companies that have become Asheville institutions, including the Laughing Seed Cafe, French Broad Food Co-Op, Malaprop’s Bookstore, and The Orange Peel. 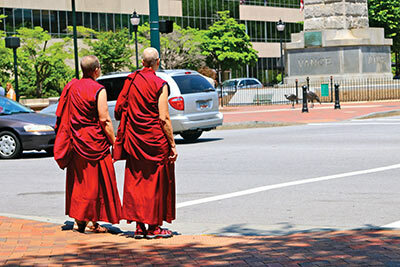 Between 1990 and 2000, Asheville’s downtown business district reported 65 percent growth due in large part to the efforts of these two mavericks and independent business owners. Tourism has been on the climb ever since, with new indie retail outlets, restaurants, and brewpubs popping up all over town. Torno herself opened CURVE Studios in 1990; it was one of the first art studios in the city’s River Arts District. 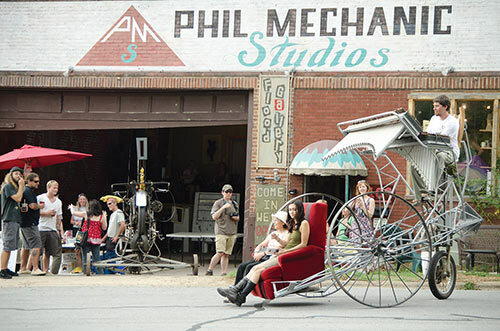 Today, under her leadership, this thriving community is home to more than 170 artists with studios in twenty-two former industrial buildings along the French Broad River. “We’re starting to have a much more vibrant arts scene in Asheville,” Torno says. In the last decade, a new generation of transplants has arrived in Asheville, many bearing the same independent spirit of those who came before them. They’ve opened inns, redefined the culinary landscape, and brewed some of the best beer in the country. The Whites—baby boomers who became entrepreneurs because they didn’t want to work for anyone else—relocated to Asheville after twenty-nine years running the Old Stone Bakery in Martha’s Vineyard. Attracted by the weather and vibrant cultural community, they bought a historic home in the Montford neighborhood in 2004, invested their life savings to fix it up, and turned it into a B&B that has been featured in Travel + Leisure and 1000 Places to See Before You Die. Built in 1899 and listed on the National Register of Historic Places, the Black Walnut’s blend of historic charm and sophisticated luxury sits in direct contrast to the notion of Asheville as a grungy, granola hippie haven. There are landscaped gardens, guest rooms filled with an array of antiques, a newly renovated carriage house, and an elegant dining room. Like the Whites, Chef Peter Pollay also came to Asheville to go his own way. Owner of Posana Cafe and president of Asheville Independent Restaurants, he’s a central figure in the town’s booming culinary scene. He credits the city’s friendly vibe for drawing a stable of chefs so good they’ve wowed Bon Appetit and Food & Wine. “We have great chefs coming to live in the mountains in a diverse, open, and welcoming community, and more people are coming to visit Asheville as a result,” says Pollay, a Chicago native. What they’re finding is a community with a palate for boundary-pushing dishes. It’s hard to get a reservation at The Admiral, where Chef Ivan Candido makes edible paper out of cilantro and tamales out of beets and goat cheese. At Cúrate, owner and chef Katie Button has earned national acclaim for her creative take on traditional Spanish tapas. Her background as a scientist is evident in dishes like smoked lardo made from acorn-fed Iberian pigs, sliced thin and served on toast with sea salt and Spanish paprika. Then there’s Chef Edwin Bloodworth, who moved to the Lex 18 Supper Club in June and is earning rave reviews for his New Appalachian Cuisine, which features locally sourced sustainable ingredients to showcase his Native American, European, African, and Southern influences. As Asheville’s buzz as a budding culinary capitol continues to build, its credibility as a haven for craft brewers (and the imbibers who love them) is also growing exponentially. The Asheville Brewing Company prides itself as the most kid-friendly brewery west of the United Kingdom, offering the largest covered outdoor patio in town and award-winning pizza. The Bier Garden is known for its extensive beer offerings, which include more than 200 imports from around the world and the best the local microbreweries have to offer. The Highland Brewing Company is one of the city’s largest brewers, with a 35,000-square-foot facility churning out more than 40,000 barrels a year, while Thirsty Monk has been ranked among the nation’s best beer bars by Paste, Garden & Gun, and numerous others. And, for those seeking something completely different, the Blue Kudzu Sake Co. is an “Appal-Asian” restaurant offering Asheville’s first locally micro-brewed sake. If you’re looking for music by Asheville’s best recording artists, you’ll find it at this independent store. Editor’s note: This article was originally published in our fall/winter 2014 issue. Since being published, three establishments mentioned in the story have closed. Please note that Karmasonics Records, Lex 18 Supper Club, and Blue Kudzu Sake Co. are no longer in operation.